Zoo Lights at Reid Park Zoo are set to open this week. 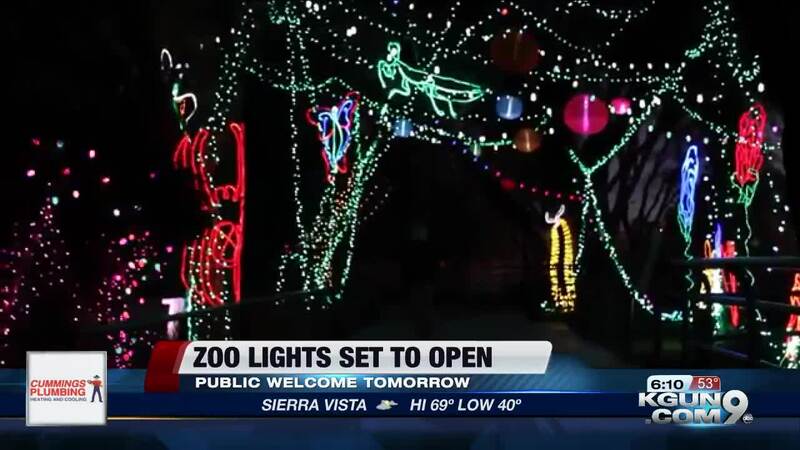 TUCSON, Ariz. - Zoo Lights at Reid Park Zoo are set to open this week. On Wednesday. Dec. 5 the light show will open for Reid Park Zoo members only. The general public will get the opportunity to enjoy the zoo lights starting Thursday, Dec. 6. Zoo Lights will have different light displays, different blow-up figures, Santa Claus, and even live music performances. This year, Zoo Lights partnered up with the Community Food Bank of Southern Arizona, the Humane Society of Southern California among others. Those who bring a child's toy, can of food, or pet food will get $1 off thier admission ticket. You can find a list of acceptable items to donate here . Zoo Lights will also have different special events, which are listed below.